Site analysis of every page on your site. Page speed and other tests to check for errors. New optimised page titles and meta descriptions. He really looks like that! GoZen is pleased to announce the launch of WedSocial on Find a Wedding Supplier. WedSocial is a new way to advertise your wedding business for free. Create a business profile, post images announce special offers. Use it any way you like. Invite your clients to join. Invite your wedding guests to join. Keep up to date with the latest wedding news. GFNetwork announces the relaunch and redesign of Find a Wedding Venue. 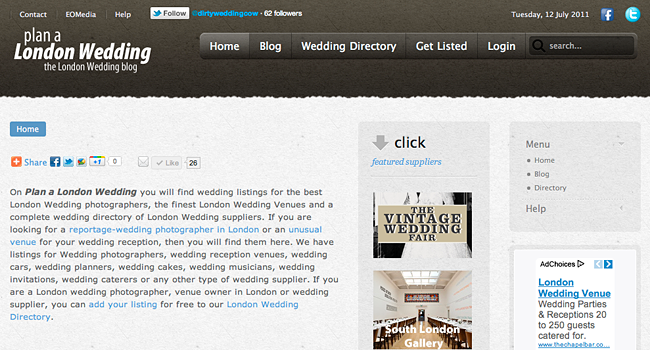 The new wedding venue finder for UK weddings is on-line now. We still have over 300 wedding venues to add and work will continue over the next few months. The new version features a greatly enhanced user experience. You can use our Radius Search function to find wedding venues within a set distance of your home, Church or Registry Office by entering your postcode. Find a Wedding Venue also features a new interactive wedding venue map. GoZen's top wedding venue website - www.findaweddingvenue.co.uk is being redesigned and will be relaunched in the next three weeks. Venue owners can submit their details to the new site once it has launched. New features include Radius Search and an interactive map allowing users to refine their search to a specific location simply by zooming in on the map. This is particularly handy if you are looking for a venue near a Church or Registry office. Venues can also now manage their listings more effectively and include up to 5 images of their venue.